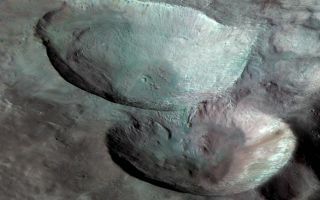 Three impact craters of different sizes, arranged in the shape of a snowman, make up one of the most striking features on Vesta, as seen in this view from NASA's Dawn mission. In this space wallpaper, three impact craters of different sizes, arranged in the shape of a snowman, make up one of the most striking features on Vesta, as seen in this view from NASA's Dawn mission. In this view the three "snowballs" are upside down, so that the shadows make the features easily recognizable. North is to the lower right in the image, which has a resolution of 230 feet (70 meters) per pixel The image is composed of many individual photographs taken between October and December 2011 by Dawn's framing camera. They were obtained during the high-altitude mapping orbit, at about 420 miles (680 kilometers) above Vesta's surface. The largest of the three craters, Marcia, has a diameter of about 40 miles (60 kilometers). The central crater, which is about 30 miles (50 kilometers) in diameter, is named Calpurnia, and the lower crater, named Minucia, has a diameter of about 14 miles (22 kilometers). Marcia and Calpurnia are possibly the result of an impact by doublet asteroids, whereas Minucia was formed by a later impact.